The Magnelephant Review: Zombies. Vampires. Robots. From Space. I have decided to review things on this blog. Mostly, books. Occasionally music. Possibly movies. Maybe you, if you are a book or a music or a movie. I'm going to begin by reviewing this picture sent to me by a faraway friend. Here are zombie vampire robots from space. They are kidnapping a red-head in a blue dress that seems not to be trying all that hard to get away. She appears to be waving goodbye. Perhaps she harbors a secret love for the rusty undead. But let's not discuss feminism. Let's discuss, instead, the font of the picture's text which recalls the font used in monster trailers from Universal Studios. These trailers had the habit of proclaiming things as, Shocking! and Terrifying!. Here is an example. 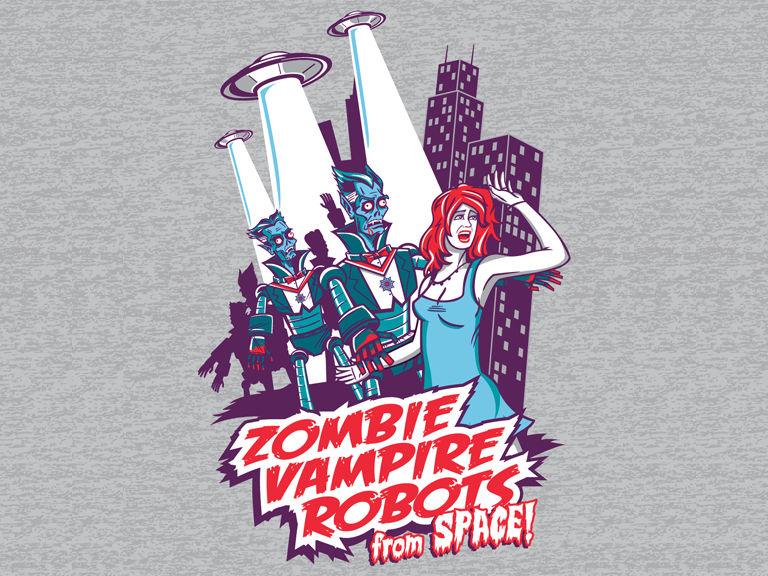 This font is appropriate, then, for a picture depicting zombie vampire robots, who are, one presumes, both shocking (being robots) and terrifying (being zombie vampires). Of note, they are not denoted as aliens, so we must assume that they, at one time, lived on our planet and were, at some later point, expelled, and then at some later, now-ish point, have since returned seeking bloody vengeance. Note, in fact, the very small print in which "From Space!" is printed. One wonders if, perhaps, the artist isn't trying to communicate humanity's buried shame over the treatment of these poor, defenseless monsters. This narrative recalls, of course, many things worthy of recall. Firstly, there are the Cylons of Battlestar Galactica, fellow robot exiles, who returned and killed all the humans except the ones on a ship they somehow overlooked. The Cylons themselves, of course, recall the progenitor of this genre as laid out in the forgotten chapter of Genesis in which the exiled Adam and Eve return to exact bloody revenge on their maker. What good's a flaming sword against a .357 Magnum? Not much, as it turns out. Death Proof owes a huge debt to this story. In conclusion, this picture recalls many great past works of science fiction and fantasy. Also, Charles Bronson. Also, it is very silly and very awesome. I give it 3 1/2 Zombie Vampire Robots from Space!. It loses a half star for not in some way incorporating 'Nazis,' which, as we all know, with their funny helmets and holocausts, are inexplicably essential for true evil silliness. Some of the reviews may be more serious than this. Anything is possible.